When the S health app opens, tap on Next. then when the Terms and conditions screen appears, tap in the box next to I agree. If you didn’t yet sign in Samsung account, please sing in. If you want to sign at later, just skip. Tap in the name box and enter your name. Tap on the Gender icon, then use the up and down arrows on the screen to edit the Date of Birth to your birthday. If you do not wish to share your profile information with other S health users, tap in the box in the bottom left corner and then tap Next. The Body measurements screen will appear. You can now enter your height and weight. If you want to change the units from feet and inches to centimeters tap in the box next to the height details. Then tap in the individual boxes and use to on screen keyboard to alter the information displayed. Enter your weight details then tap Next. Select your Activity Level, then tap on Next. Now your profile has been created tap on Start. You can now begin using the S Health app. Swipe the screen to the right, and then Tap on UV. Point the sensor on the back of the device directly at the sun. Tap Next. Tap Start to begin measuring the UV intensity. Tap on the Summary view Icon to return to the previous screen. To access S Health settings, tap on the Menu icon and then tap Settings. Gently place your finger on the sensor to start the measurement. Make sure your fingertip is on the centre of the sensor and Do not press too hard. Wait until S Health has finished measuring before taking your finger off the sensor. Swipe the screen to the right, and then Tap on SpO2. 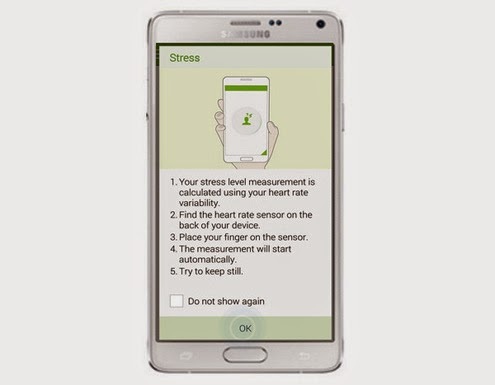 The S Health app is also equipped with a function of stress level measurement. Tap Stress. Gently place your finger on the sensor to start the measurement. Make sure your fingertip is on the center of the sensor and Do not press too hard. The measurement will start automatically. Wait until S Health has finished measuring before taking your finger off the sensor.It may take a few seconds to complete the measurement.